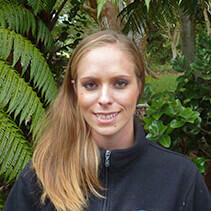 Amy Kuhar serves San Diego Zoo Global as a Senior Research Coordinator in Recovery Ecology. Part of the staff of the Hawaii Endangered Bird Conservation Program, she is based at the Keauhou Bird Conservation Center. There she helps care for our flock of endangered Hawaiian forest birds. Amy’s efforts go beyond simply feeding birds and cleaning aviaries. She is always eager to help with the wide range of maintenance tasks required to keep the facility’s 26 buildings running smoothly. She also helps the ‘alala species captain monitor the 16 cameras that are trained on ‘alala nests during the breeding season. Amy also works in the office, managing finances and ordering supplies for the Center. Amy joined the Keauhou team in 2012. Previously, she was an intern at the Maui Bird Conservation Center. In the last three years, Amy has been working with colleagues to learn more about the breeding biology of the ‘alala. She is currently interested in investigating the parent-rearing process. She has a long-standing interest in the evolution of island species. A study on the American crow population in her hometown of Ithaca, New York, sparked her initial interest in corvids. Hawaii represented an opportunity to bring both of her interests together. Amy earned her bachelor’s degree in Biology from State University of New York, Fredonia. Amy has written numerous blogs on her work with endangered Hawaiian forest birds. When she is not as work, she is usually near the island’s active volcano trying to get as close as humanly possible to some red hot lava.